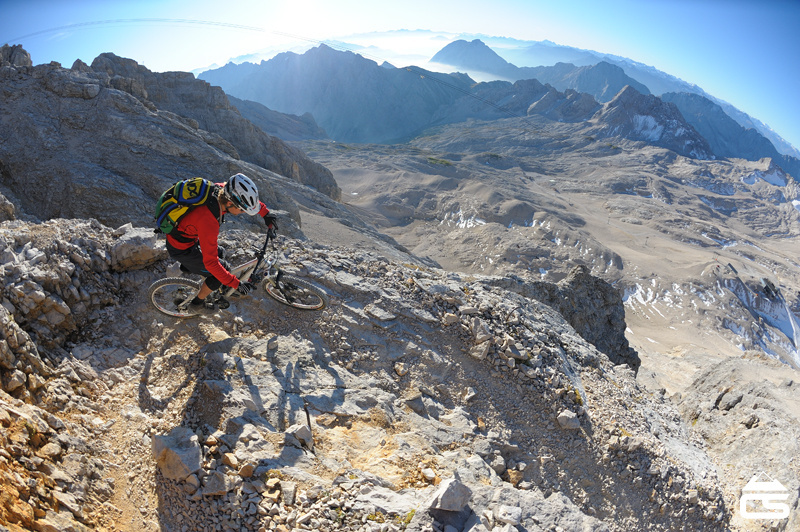 The following article, originally written by Max Schumann and posted on the German website www.mtb-news.de, has been translated into English by me and it's an account to fit together with my film called "Zugspitze-X". 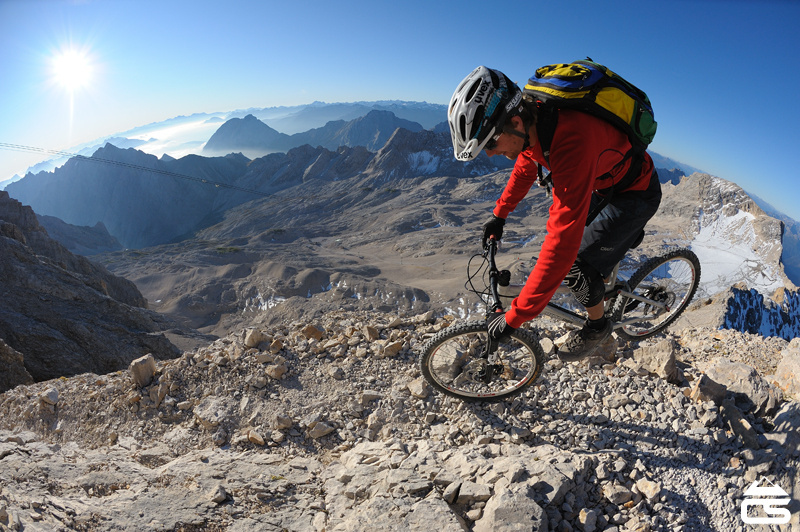 Does the Zugspitze by bike make sense? The Zugspitze is one of those mountains that attract attention in a special way. Especially considering that the 2962m summit is the highest mountain in Germany. This motivates a lot of mountaineers throughout the whole summer to put in some sweat and hard work to climb to the summit, or just pay €48 for the Gondola. 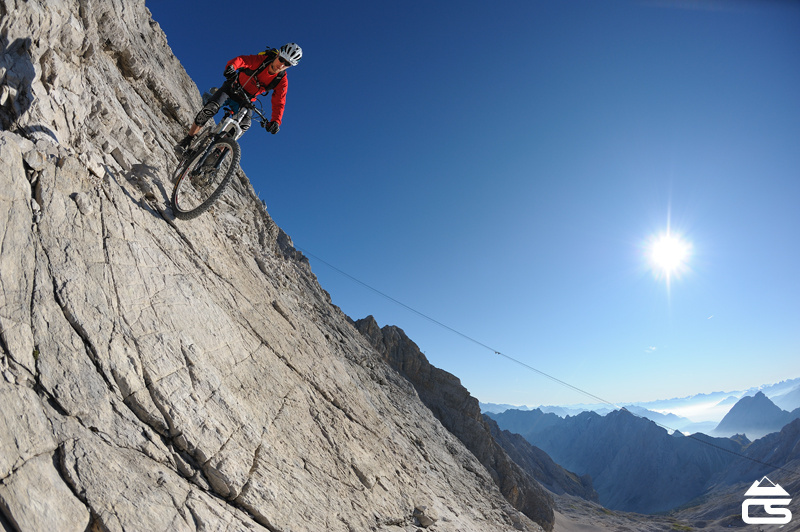 For a long time, I too have been attracted to this idea of climbing the Zugspitze, but with my bike. Mountain tours make sense to me if they offer a lot of down hill riding fun, both in summer and winter time. Consequently, I am looking for beautiful and memorable trails here in the local area or in other mountain ranges. 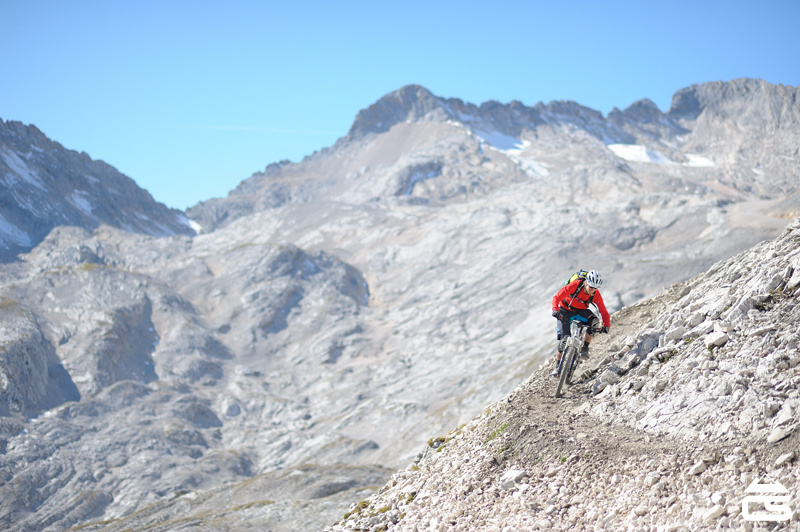 The tour of the Zugspitze is one of my favorite trails. 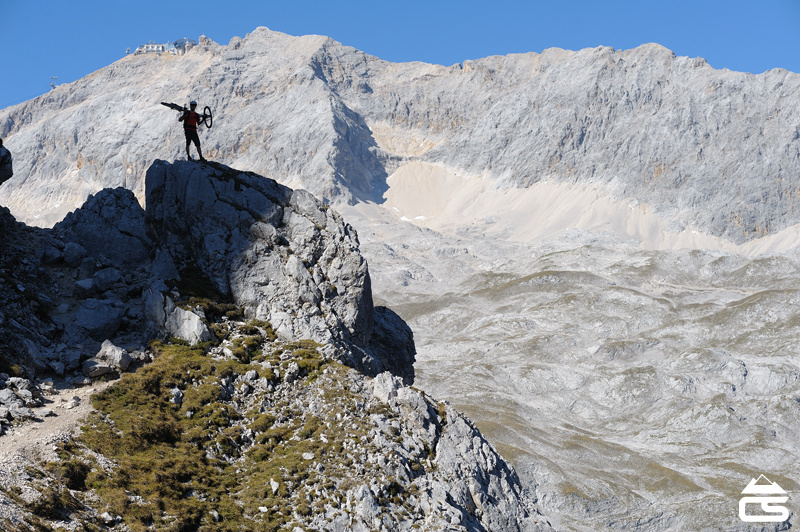 The climbing is a touristy must-do thing and the riding down is an extreme challenge. 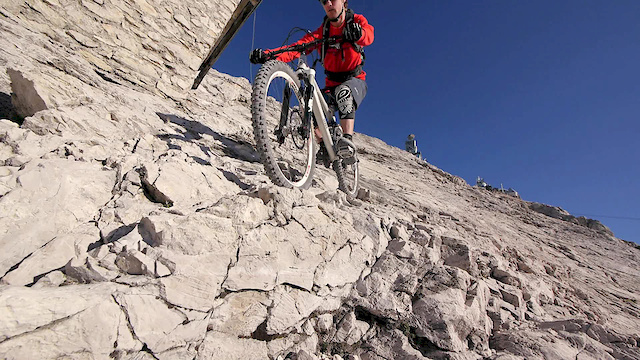 I knew that the descent from the summit was possible after speaking to some other Garmisch locals who are also extreme bikers who know the area intimately. If it makes sense in the end to ride this section then you have to decide for yourself, it depends on your personal taste, your experience and vertride performance. I had been wanting to do this for a long time but always something came up that prevented me from doing it. Other mountains or projects were in the way or the weather was bad or I had to do some studying for University. This Fall all the conditions finally came together to achieve this descent. A long period of stable weather offered us perfect high mountain conditions and dry rock with no snow on the critical passages. Quite often the late season also means that there are less hikers, especially mid-week. I took the crazy mountain bike photographer and filmer Colin Stewart on a Monday morning at the beginning of October to do this project. Starting point was in a village called Erhwald and from there there is a pleasant ascent on forest road to begin with, slowly changing into single trail and going on up to the Zugspitze Plateau. As we went over a pass from Austria back into Germany we got our first glimpse of the summit. Here we began pushing and carrying our bikes over to the Knörhütte where we planned to spend the night. We aimed to have a relaxed afternoon on the sunny terrace at the hut and enjoy some amazing alpine views. In the evening we had some great “Bergsteiger Essen” with a couple of Weiss biers and a Schnapps. We hit the sacks early that evening because we wanted to leave the next morning at 3am. It seemed only 5 mins later when we were standing outside the hut at 3am holding our bikes and with head lamps on. Surrounded by awesome rocky mountains that were all the more impressive in semi-darkness. It was windy and the stars shone brightly, it was very atmospheric. Colin got impatient and wanted to start because there was no way he was going to miss the summit sunrise. It took us an hour and a half up to Sonnalpin at the head of the Zugspitze plateau, some sections of that we could even ride. From here the steeper climb up the summit ridge line begins and Colin left his bike hidden behind a rock. I shouldered my bike and it took another one and a half hours to reach the summit. After the initial scree most of the way is secured with wires. We couldn't see much in the dark but could still feel the exposure, especially with the strong winds. At this hour, which is normally wake up time for me, I was feeling a little uneasy, however, after exactly three hours we were finally on top. After yesterday's high alpine ambience we suddenly hit the top tourist zone which is the summit area of the Zugspitz. Suddenly we faced terraces, cosy huts, kiosks and telescopes. It was still pre-dawn and we climbed over to the summit rock itself and sat and looked East waiting to enjoy the warming colors of the sunrise sky. These 20 minutes of incredibly changing light made the pain of the climb suddenly worthwhile. 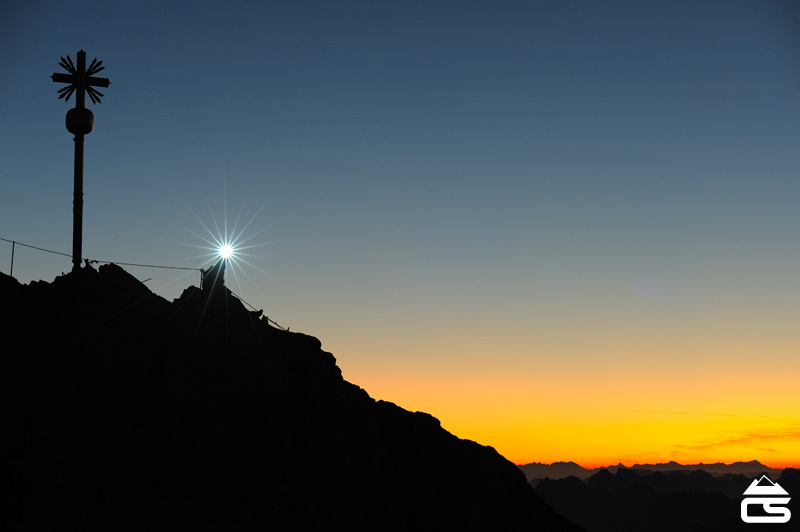 Our aim was to catch the sunrise from the summit and in the early morning light to ride the rocky ridge line trail down to the SonnAlpin. This part of the descent is very steep, narrow and exposed with many fixed wires for the safety of hikers. It was essential to do it early before any hikers came up and to be extra careful to avoid causing any stone fall inadvertently displaced by riding. After warming up for 10 mins in the Müncher Haus with hot coffee and chatting to a curious hut warden about a bike appearing in front of his door, I put my pack on and saddled up on the bike. The descent literally started from the front door of the hut. I was excited with lots of adrenaline pumping through my veins. It was quite windy to start with and the steep steps off the summit terrace were a tough warm up. It took me about 15 minutes to really get going again. I began rolling slowly down and tried not to look to much either side of me because of the huge drops, on the left back down to the Knörhütte and on the right to Garmisch. I had to be careful about many of the small stones because they were like ball bearings and coupled with the high winds on the initial section made it very sketchy. After several bends the trail dropped left, we got out of the strong wind and I slowly found more flow. I trusted my tyres and brakes and my skill and it began to go better than I thought it would. After a few flowy bends I became more relaxed and continued over some rocky steps. The safety wire was always running beside me at the same height as my bars and only offering me false safety. Colin followed me on foot with the camera gear and on some of the steeper sections he may even have been slower than I was. All of a sudden there was a very steep smooth rock slab beside a small hut. It took me a couple of roll-ins before I was certain I could ride it and that the rubber of my tyres would really stick to the rock. Consequences of stacking on this section were unthinkable, Colin was not even forcing me to ride it for the camera but I ended up riding this section twice. These are moments when the bike and materials reach their limits and this is one of the reasons why I am motivated to ride such tours. After years of experience you develop and ride passages which you thought would never be possible. But it is very important to be realistic and honest about your skills and carefully consider the consequences. After riding this crux slab there were still some steep technical sections but the exposure was much less. Finally, I reached the end of the rock ridge and had some fun sliding down the final scree slops back down to the Sonnalpin. At this point we meet the first of the hikers coming up from the hut, so timing turned out to be perfect and we were both happy that we faced no traffic higher up. The hikers all shaked their heads in disbelief but they were all very friendly. They all asked if doing such a descent by bike really made sense. I couldn't really give them a straight answer and I understood their doubts. It's a lot of fun in a crazy way but in some ways it makes no sense to push the limits in high alpine areas. Colin found his bike and we both rode the easier and faster trail back down to the Knörrhütte. The exposure risk was suddenly gone, the trail much easier and I could relax and ride much faster. We made it back in time for lunch at the hut with big pasta, a cold beer and some sweet cake. We chilled for an hour or so at the hut and then made the beautiful descent through Rein Tal with the amazing Fall colors on the trees back to Garmisch. We hit the town late afternoon and returned to civilization with memories of a beautiful mountain sunrise seemingly only hours beforehand. I've got to say this after seeing people slag the Inversion Riders videos also posted by Colin (I believe Max was in that video too). Having ridden in some limited places in Switzerland and seeing these trails it's hard to believe how technical they are. You absolutely positively need to do those rear wheel hops and crawl down some sections to get down the trail without dabbing or walking or crashing. These trails must be hundreds of years old, They are eroded sedimentary choss with sharp switchbacks for hikers (certainly not hikers) and you would certainly lose so much skin if you went down. So to ride them you have to be very precise and so very in control (ie front tire must roll over this 2 cms rock and you must be left of that rock and then pivot to clear your rear wheel and derailleur around another rock). I know this is already too much typing for the attention-deficit among us but anyone who opens their mind to this style of riding (which btw really reminds me of old school Shore riding "back-in-the-day") will appreciate the level of skill, commitment and finesse in these videos. Not to mention the patience of the cinematographer who captured all of these angles. The section at 2:47... wow... slabs can be quite tricky but that one seems to take the cake. ... And I'll assume that falling clearly wasn't an option. That bit was insane, I truely wouldn't have believed that was possible before seeing that. @ 4:30 he totally put his foot down.... but don't be to harsh, who wouldn't stop for a beer in a remote mountain valley after an epic like that. Some amazing riding, scenery and documenting! Thanks for sharing! I hesitate walk down most of that HAHAHAHAHA. well done rider in the video + what forks? People should go to south mountain in Phoenix Arizona if you think that's technical! You live in BC, you have the best stuff anywhere. Amazing, inspiring as usual from you guys. Great writing, it felt alomst like reading Gaston Rebufatt "stars and storms". Who knows maybe one day you will write a mountain biking book comparable to those climbing ones It gives such a show of skills and experience, then you guys don't ride latest an greatest carbo-plastic toys, i guess supporting your local brands. Rhen ypu ride "normal" challenging trails. If it was freeride-entertaibment production you would have 100 stickers per sqare cm of your clothing, 2013 bike with 2014 fork, and you would travel to some stupid place like Gobi desert where it is impossible to ride wthout digging for 5 days. Love it! True mountain biking! A truly awesome video!! In 1985 a buddy of mine, Jeff O. and I, were actually the first people to ever ride down the Zugspitz (as far as we know..). After we did it a local bike shop sponsored a film of us and a couple of others riding up and down. The idea was to get people interested in Mountain Bikes. Nobody knew much about them then, there were probably only a handfull in the valley. By the time the filming and our fun was over I did 12 decents and one accent. One VERY big difference though; we did NOT make it to the peak, but to the station about 200 m below. The film was intended to be shown on a kind of German version of Wide World of Sports, but we got bumped by Boris Becker cause he just won Wimbleton. Has to be some of the most awesome biking in the world!!! Nothing beats snow chutes and long skree fields on a bike!!!! Agreed, and it is not like he had lots of practice on that trail - I guess it was all on-sight AND within his level of safety. That means he is an even better rider than we see in the video. Very impressive. he won a few trophies this year (enduro races all over europe). so yes, he is the man you describe... =) great and versatile rider! What size of front shock..? This area reminds me of the summit at Anthony Lakes Oregon US. Great riding in that part of Oregon..
Really, reaaallly amazing... but... it would just bother that you'd spend so much time going down the trail having to hold back (for fear of death) unable to seriously let rip! Amazingly skillful though. AND brake pads?!?!?!?! I bet Magura are regretting sponsoring that mess of brakepad dust!!! I had a bash at Colin a little while ago about riding the Alpspitz. But I'm not going to do it this time. Amazing Video !! It doesn't do justice though to just how exposed some of those top sections are ! A "Get-off" is absolutely no option ! And as to getting up early to avoid the Hikers ... yeah , it's the only way to do it here in Germany. Especially on a Saturday morning when they're all washing their cars :-) ! I've hiked half way up this mountain, the video does no justice to the technicality of the trail. I would love to see more footage of the riding or better yet ride it myself! OK, So I have to give props for the amazing skills. I just wanna know how much was left of your rear brake after this? what ever brakes you have seem to be working amazingly. also, what bike is that? X2 on the bike??? Almost looks like one of those old Iron Horse SSO bikes... Sweet vid too man, that is some serious TECH riding. Bike ist Fatmodul Ant. Quite small german brand located in Munich. in this case I higly recommend visting Alpha Bikes in Munich. Great shop with really helpfull staff. There you can testride the ANT a whole day or a whole weekend (Friday to Tuesday!) for a really small fee including some friendly recommendations where to shred best around Munich. I did so with a Liteville 301 and although I did not buy it in the end, the shop scored highest with their friendly and dedicated approach. Thanks for the info mate, I'll put it in my ever growing file of places/things to look into for our honeymoon aye... Thankfully Bikes will be a pretty high priority for me (and now her...) so this is great stuff. Again, thanks. I got to ride a trail similar to this, just a really, really gnarly, almost all rock hiking trail with slabs throughout. Its a whole different type of riding then your standard DH riding. lots of balance skills and just manning up to sections (all while trying to not mangle your derailur). this guy made it look easy, its not at all, awesome video. I have been there and the last thing on my mind was to ride a bike at the top of this mountain. Insane steeps and drop offs. Kudo's to this guy and his skills. Awesome stuff. My kind of riding! Reminds me of a sick hiking trailer I found in 2010 in 2 Alpes. The only bit that kinda worried me was the slab part! Good read. 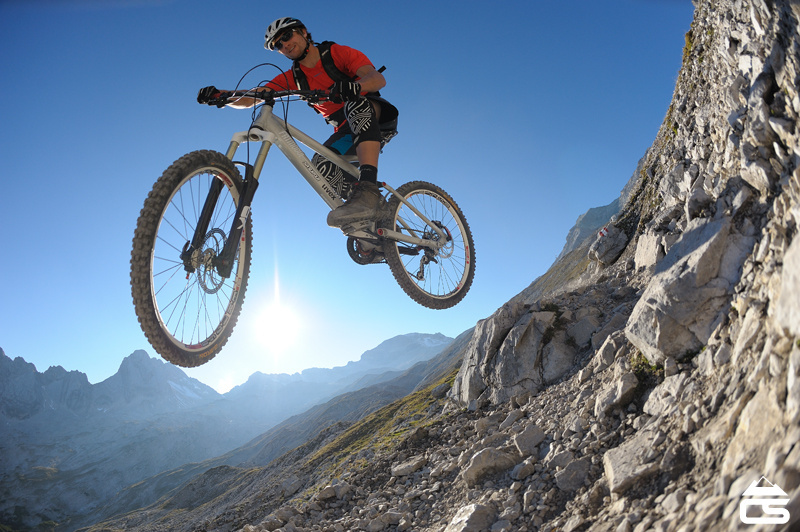 I love this style of mountain biking. I look forward to your next adventure! Most mountains with gondolas are wheelchair accessible. Even this one is. Another epic ride.. It kind of reminds me of INTO THIN AIR. I love these nose-pivoting euros! I usually curse switchbacks and walk them, but I'm going to look at them as a challenge from now on. Can we see the bloopers ? Proper mate at the end, waiting with the beers. Great edit, awesome riding! That was a breathtaking ride on the "edge"
Blown away... amazing riding! One of the best clips on PB! Very impressive and beautiful. The rest of us are mere posers. Check out the corners at the beginning! Sweet! This place is AMAZING!!! I went snowboarding here a few winters in a row!! Gee, I wish that was my morning breakfast run too. How 'bout that arm pump?! Great edit. The riding at the top of the mountain was insane! Loved it. Magura + Uvex ha haa, gotta rub in the Germany. That looks like it would be a blast to ride. Den würde ich auch gerne als Hometrail haben! Dude.......... just ride the Mother Freaking Mountain MANNNN!!! Forget all that fancy gay flip of the rear tire around corners... What the heck is this a bike exhibition???. Ride the damn bike..... have some fun, ride that shiz or get off it.